If you want to strip unwanted fat off your body, you need to look first to your diet. However, once that is taken care of, it is time to look at your training. I’m always looking for ways to make the valuable time you spend training more efficient and effective. If you want to speed up fat loss for yourself or your clients, here are some ways to improve your fat loss training programs. Effective training program design starts with picking hard exercises. Even with the best possible selection of all other training variables (e.g. sets, reps, tempos, etc.) a program made up of inferior exercises will fail. One way to instantly burn more calories during and after your training session is to replace exercises that let you sit or lie down with ones that have you on your feet. You will be amazed at how much harder and more effective your training program becomes. There are many fantastic exercises that are bad choices for metabolic training. Take the Olympic lifts for example. They are fantastic for improving explosive power and athleticism when done for low reps. Yes, you can do them with high reps and that will make you really tired. However high rep Olympic lifts can also make you injured and create sloppy motor patterns. Instead, use explosive power exercises or heavy barbell training for low reps and when you want to create that metabolic training effect, select exercises more suited to fatigue. Sled pushing/pulling or hill sprints are much better choices for conditioning and metabolic training. While unilateral (i.e. one arm or leg at a time) exercises are often included in performance programs to correct asymmetries, they are a fantastic tool for fat loss. Coach Dan John wisely points out that doing only one limb at a time requires a lot more stability work from your body and thus increases the metabolic demand of the exercise. While I’m not anti-split routine, I rarely use them for fat loss. I don’t care how are you work, but triceps day will not impact your metabolism as much as doing some hard upper and lower body multi-joint movements. When I have a client or athlete who needs to drop body fat fast, my go-to program is a 4-day whole body routine. Of course there are times when I use other layouts, but if you are past the beginner stage and have the time and energy, this can work great! The trick is making sure you vary intensities throughout the day and pick joint-friendly exercises. If you can only train 3 times per week, don’t worry, but if you will usually make even better results if you can get that fourth day in. In this case, I would do 2 metabolic sessions and one session that alternates between power and heavy strength training most weeks. Too often people focus on endurance training for fat loss. While this can help burn some calories, it also teaches your body to preserve energy. You see this all the time in group fitness classes. Everyone uses light weights and does endless reps and sets. As a result, you naturally learn to preserve energy. By including some strength, speed and power work into your training, you will learn to expend energy. This can be done at the start of your session or take a day or two during the week to specifically focus on it. 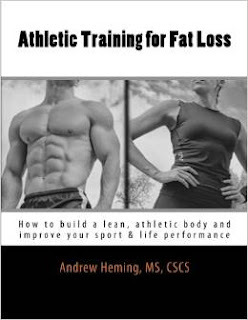 Stay tuned for next week when I'll have 6 more fat loss program design tips for you. In the mean time, check out my book Athletic Training for Fat Loss for a complete guide to burning fat and sculpting a lean, athletic, high-performance body HERE.